I love it when software surprises me in a pleasant way. These are the things you need to know before you create a video or elearning product! I set up the system I was documenting, in a window, on the left side of my screen. I set up my Word document — the storyboard — on the right. I used Snagit to capture graphics, but you can use whatever screen capture tool you have. 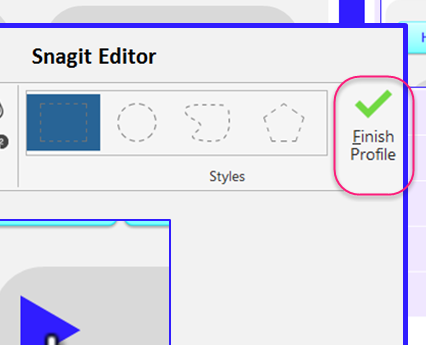 When I take a screenshot, the Snagit image editor opens and I put that window on the left as well. It’s important I’m able to see the Word document on the right so I can quickly check my cursor placement. Storyboard on one side, content and screen capture tool on the other. In the content system, take your screenshot. (Tip 1: Create a keyboard shortcut that activates the screen capture. Tip 2: Zoom-in! Don’t be afraid to capture just the button, or field. Maybe include a tiny bit more for context, but zoom-in.) The editor automatically opens. In the editor, edit the screenshot. I like the “hand-cursor” stamp for buttons. Make the shot look the way you want. 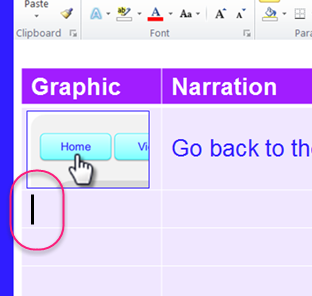 Place your cursor in the storyboard where you want the graphic inserted. Then, with one click, send that screenshot to Word. Add stamps, highlights, callouts in the Editor, then use the one-click Finish. I’ve always known that Snagit can do this but I didn’t actually put it into use until this project when I had to replace so many images. And the beauty of it only then made itself known. 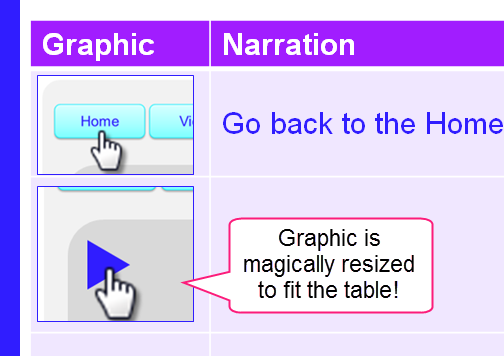 I use tables in Word for my storyboards: graphics on the left, narration on the right. If I set up that “output to Word” profile in Snagit and let Snagit put that screenshot into Word, it fits, every time. It’s like magic. I didn’t expect it to do that. Getting an image into Word without this trick is not that time consuming (Ctrl+C, Ctrl+V), but having to re-size the graphics was getting very tedious! 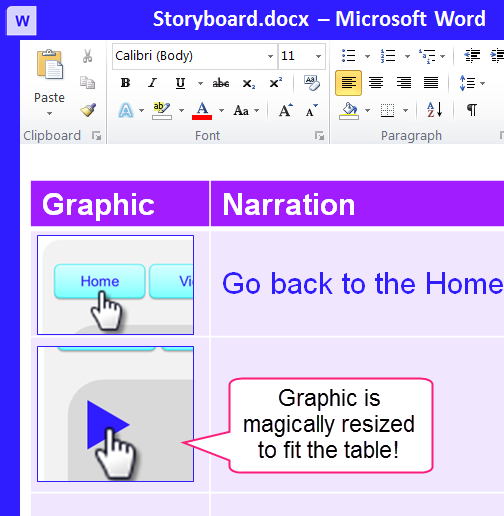 When Snagit inserts a graphic into Word, it magically gets re-sized! I just love it when software surprises me in a good way! Disclaimer: I haven’t been able to get this to work on my Mac, just my Windows 7 laptop. How has software surprised you lately — in a good way? Can anyone create an online course?